Torrey House Press, 9781937226978, 98pp. As Edward Abbey's Desert Solitaire: A Season in the Wilderness turns fifty, its iconic author, who has inspired generations of rebel-rousing advocacy on behalf of the American West, is due for a tribute as well as a talking to. 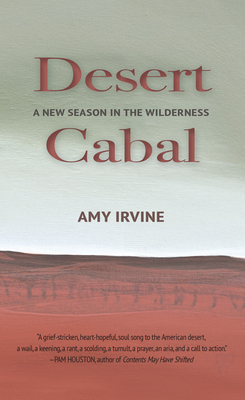 In Desert Cabal: A New Season in the Wilderness, Amy Irvine admires the man who influenced her life and work while challenging all that is dated--offensive, even--between the covers of Abbey's environmental classic. Irvine names and questions the "lone male" narrative--white and privileged as it is--that still has its boots planted firmly at the center of today's wilderness movement, even as she celebrates the lens through which Abbey taught so many to love the wild remains of the nation. From Abbey's quiet notion of solitude to Irvine's roaring cabal, the desert just got hotter, and its defenders more nuanced and numerous. "A slim volume reminiscent of the mass-market paperback copies of Desert Solitaire that so many of us have stuffed into a dusty backpack or stowed in the glove compartment on national park road trips... Irvine tells Abbey about climate change, fossil fuel dependence, and the environmental pickle in which we've found ourselves." "Abbey's self-claimed country, Irvine says, is at risk for exactly the reasons he said it would be: greed, gasoline, and a gaping well of apathy. Preserving wilderness is even more important now than it was half a century ago, but the stakes aren't as simple as he set them out to be. Desert Cabal has riled up some Abbey fans, but that's exactly what makes it an important read." "A lyrical and raw conversation between Irvine and Abbey that is part tribute, part memoir, and part polemic. It'll get you thinking about the state of the desert, the fate of the wilderness movement and the actions we all need to take to save the places we love (including leaving them alone)." "With humor, wisdom and a sense of urgency, Irvine uses Desert Solitaire as a jumping off point to assess the current state of the world, to expose the very human error of the literary heroes on dusty pedestals, and to reinsert many of us back into the narrative... No matter your feelings about Edward Abbey, Irvine's Desert Cabal adds necessary depth to the dialogue. Many of us have been waiting years for that." "While Irvine shares the love Abbey, who died in 1989, had for Utah's public lands, she contends some views and sentiments from his time need to be challenged. She points out privileges Abbey enjoyed as a white male; she questions his use of 'Abbey's country.' From Abbey's first morning in the desert to his tale of a snake that guarded his campsite, Irvine questions and compares their experiences, including their failed marriages." "The Abbey whom Irvine is talking to is neither the author himself nor a corpse; he's a literary ghost, one that has been living inside herself ever since she fell for his writing." "Fierce and clear--Irvine's book effectively confronts the ritual of veneration and brings the reader closer to appreciating Abbey's work in a more constructive, relevant and productive frame than what has been allowed in the last five decades." "This iconoclastic inner discussion with her predecessor, Abbey, is fascinating--wherein Irvine challenges Abbey to consider his myopic, privileged perspective without failing in her deference for his attempt to raise consciousness of an entire generation prior." "At once intimate and expansive...a reminder that individuals, even titans like Abbey, can only do so much to save the 'best places.' It really does take a village (or cabal)." "A lyrical, raw and vulnerable conversation." "The news Irvine breaks graveside is that the world, and specifically 'Abbey's country, ' has changed... and there's no telling where Abbey's] sentiments would place him in a landscape that now includes Standing Rock and Black Lives Matter, a generation of female activists and the #MeToo movement." "Irvine gradually builds to a ringing conclusion, stating simply and clearly that wilderness lovers 'need intimacy with people every bit as much as with place' and that 'going it alone is a failure of contribution and compassion.'" "While an admirer of Abbey, Irvine illuminates his dated attitudes as she writes a love letter to the Utah desert. This brief series of essays will be enjoyed by those who treasure the desert, environmental activists, and fans of Desert Solitaire." "A grief-stricken, heart-hopeful, soul song to the American Desert, a wail, a keening, a rant, a scolding, a tumult, a prayer, an aria, and a call to action. Amy Irvine implores us to trade in our solitude for solidarity, to recognize ourselves in each other and in the places we love, so that we might come together to save them. In this time of all out war being waged on America's Public Lands, I'm glad she's on my side." "Amy Irvine is Ed Abbey's underworld, her roots reaching into the dark, hidden water. In a powerful, dreamlike series of essays, she lays Desert Solitaire bare, looking back at the man who wrote the book and the desert left behind. This stream of consciousness, this conversation, this broadside is an alternate version of Abbey's country. It is another voice in the wilderness." "Ed Abbey's rise to sainthood has been a bit awkward: here is an earth hero who guzzles gas in search of his personal Eden, a champion of the underdog who snubs Mexican and Native people, an anarchist rabble-rouser who utters not a peep about his perch atop the patriarchy. Finally someone--and it could be no better iconoclast than Amy Irvine--wrassles him off the pedestal back down to the red dirt where he belongs. Half riot, half tribute, this is a roadmap through a crisis that neither Abbey nor any of us imagined." "If you've ever talked back to the canonical tomes of the environmental movement, this is a book for you. Here are the women, the people, the children, and the intimate dangers those old books so frequently erased. Here is a new and necessary ethic that might help us more openly love the land and the many living beings who share it. I found myself nodding--Yes Yes Thank you --on nearly every page of Desert Cabal." Amy Irvine is a sixth-generation Utahn and long-time public lands activist. Her work has been published in Orion, Pacific Standard, High Desert Journal, Climbing, Triquarterly, and other publications. Her memoir, Trespass: Living at the Edge of the Promised Land, received the Orion Book Award, the Ellen Meloy Desert Writers Award, and Colorado Book Award. Her essay "Spectral Light," which appeared in Orion and The Best American Science and Nature Writing, was a finalist for the Pen Award in Journalism, and her recent essay, "Conflagrations: Motherhood, Madness and a Planet on Fire" appeared among the 2017 Best American Essays' list of Notables. Irvine teaches in the Mountainview Low-Residency MFA Program of Southern New Hampshire University--in the White Mountains of New England. She lives and writes off the grid in southwest Colorado, just spitting distance from her Utah homeland.